Gladstone's Land was the home of a prosperous Edinburgh merchant, Thomas Gledstanes, in the 17th century. But Gledstanes also let out parts of the building to different tenants, and in the style of the times the 'land' housed people of different classes and backgrounds under the one roof. 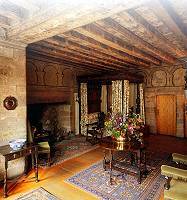 On the Royal Mile, near Edinburgh Castle, the house has authentic decoration and two floors are furnished to give visitors an impression of life in Edinburgh's Old town some 300 years ago. Features of the building are the remarkable painted ceilings and the reconstructed shop booth complete with replicas of 17th-century goods. By the mid 18th-century, increasing population and lack of building space encouraged those who could afford it to move to the New Town, which was fast developing. Visitors can contrast Gladstone's Land with a fine example of a New Town residence The Georgian House, at No 7 Charlotte Square. In Edinburgh's Royal Mile, near the castle at 477B Lawnmarket.